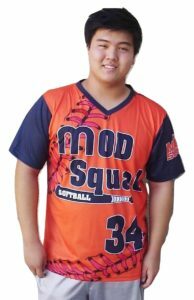 Our performance v-neck men’s softball jerseys look great and are the perfect choice for your team. Add a front team names, logos, player names, front and back numbers, flags, and sponsor name, all decoration work is included with the cost of the jersey. Separate yourself from the other teams with your new custom v-neck softball jerseys from SSU.